If you’re looking for an easy, delicious, and filling way to use up all the yummy carrots and cabbage in the veggie subscriptions this week look no further! These flavor filled sandwiches are my go to when I craving a bit of healthy bbq flavor to remind me of summer cook outs in all this rain. This recipe is so easy and makes plant based foodies and omnivores alike fawn over it. Hope you enjoy! Spices- a shake or so of each adjust to your liking! Preheat oven to 385° and line a baking sheet with parchment paper(if you don’t have parchment paper feel free to lightly grease the pan instead). Using a grater or food processor, grate/shred carrots. Finely chop bell pepper and onion. Add all the veggies, spices, and olive oil to the baking sheet and mix so they are evenly incorporated. Cover the pan with aluminum foil and roast for 20 minutes(stir or shake pan at around 10 minutes to ensure even cooking). While the veggies are cooking slice up some cabbage to add a cool crisp crunch to your sandwiches. If you’d like toast your rolls while the veggies are cooking as well. Once the 20 minutes are up your veggies should be soft and slightly caramelized. Add your favorite bbq sauce and mix evenly so all the veggies are covered and stuff your rolls full, top with sliced cabbage or any other toppings you want and enjoy! Hey food LOVERS! Happy love day to all of you! If you’re staying in tonight, with friends, on your own, or with a significant other here is a meal that I love to cook and love to eat! Pasta is one if my go-to meals and this homemade pasta is easy, impressive, and delicious! Try it out tonight to treat yourself to something special. ps there’s a vegan version below this recipe if you’re not into eggs. Place flour on a clean countertop in a small mound. Make a well in the center and crack eggs into it. Using a fork, carefully beat eggs and mix into flour until a dough forms. Knead the dough until it becomes firm and smooth, feel free to dust it with flour as needed so it doesn’t stick to your hands or the counter! Shape the dough into a ball and cut into 4 pieces. Flatten on piece into a rectangle and roll with a rolling pin until it is thin enough to see your hand through when held up to the light. Once this is done, use a sharp knife to cut your pasta into any shape you desire! While you’re doing this make sure the other pieces of dough are covered by a clean dish towel so they don’t dry out. Repeat this with the other three pieces of dough. Boil your fresh pasta in lightly salted water for about 2 to 3 minutes or until it floats and is tender to your liking. It cooks super fast so don’t go too far while it in the water! To make this pasta vegan is beyond easy! Just substitute the eggs for 1/2 cup of warm water and you’ll be on you’re way to a delicious fresh pasta meal! I think this pasta is so amazing it deserves to be the star of the show so I would combine it with some sautéed rainbow chard(from the Dinner Dash Deliciousness blog post), olive oil, salt and pepper, a splash of balsamic vinegar, and some sautéed diced tomato. Get creative with this though and add your favorite veggies and spices to really make this dish special! To round out the meal add a salad, like shredded beet and kale salad (from yesterday’s blog post) and a decadent dessert like the rich vegan brownies (from the Dinner Dash Deliciousness blog post). This Valentine’s day treat yourself or someone special to a veggie filled, homemade, Valentine’s dinner! Valentine’s day is all about love and you know here at the Real Food Collaborative we LOVE a real food filled meal anytime of the year. This salad is the perfect edition to a decadent main dish or can be the main event in and of itself it’s just that good! This recipe is from Lively Table. Feel free to add any extra veggies you want, i suggest carrots, cabbage, or escarole! Looking for a dish to warm you up this winter? With the cold weather settling in one of my go-to warm dishes is red curry. I love curry because of its complex array of flavors and smells and that it can be made in advance and reheated for a quick meal on busy days. It’s also the perfect way to cook leftover veggies or veggies that are on their way to being too soft. This curry was made using a simmer sauce I bought at the SLO Food Co-op but you’re welcome to make your own sauce if you have the time! Add onion, cauliflower, and bell pepper and cook for 5 minutes or until aromatic and beginning to get tender. Add chickpeas, rainbow chard, and simmer sauce. Simmer on medium to medium low for 10 minutes. To make this meal even heartier serve the curry with brown rice or flatbread of any sort! I’ve linked my favorite pita bread recipe here. Last weekends event was one for the books! If you’ve been wondering how each of the delicious dinner dash dishes came to be look no further because we have compiled them here! Pick your favorites and recreate the dishes from the Winter Quarter Dinner Dash. To make your own appetizer board just choose your favorite hummus, cheese, crackers, and veggies and arrange them nicely! Your guest will be impressed and its easy as can be. A nice glass of sangria couldn’t hurt either! Pre-heat oven to 400 degrees Fahrenheit. Place cubed butternut squash and garlic cloves on large sheet pan and toss with olive oil, 1 teaspoon salt and 1/4 teaspoon black pepper. Bake butternut squash until fork tender, about 50 minutes. Turn the oven down to 350 degrees. Cook pasta according to package directions. 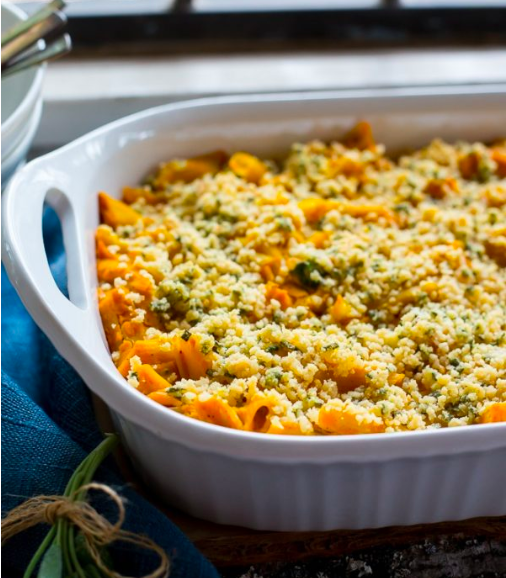 While pasta is cooking, add the roasted butternut squash, nutritional yeast, herbs de provence, nutmeg, 1/4 teaspoon salt, onion powder, paprika, 1/4 teaspoon black pepper and almond milk to a blender and blend until you have a creamy sauce. Add the cooked pasta and butternut squash sauce to a large bowl and mix until combined. Pour mixture into a large backing dish (about 9×11). Use a spoon to smooth out the top. Heat a small saucepan over medium heat and add the butter. Once butter is melted, add the bread crumbs and sage and stir until combined. Evenly top the mac n cheese with the bread crumbs and bake until heated through and topping is crispy, 25-30 minutes. Place on a baking sheet and drizzle with olive oil. Season to taste. Bake for 20-30 minutes, stirring/flipping every 10 minutes or so until tender and slightly crisp. Add pesto and stir potatoes until evenly coated. Bake for 5-10 more minutes. Mixing the dough: If you are using instant yeast: In a large mixing bowl, whisk together the flour, salt, sugar, and instant yeast. Add the water. Mix until the flour is absorbed. If you are using active-dry yeast: In a small mixing bowl, dissolve the sugar into the water. Sprinkle the yeast over top. There is no need to stir it up. Let it stand for about 10 to 15 minutes or until the mixture is foamy and/or bubbling just a bit . Meanwhile, in a large bowl, whisk together the flour and salt. When the yeast-water-sugar mixture is foamy, stir it up, and add it to the flour bowl. Mix until the flour is absorbed. Cover bowl with a tea towel or plastic wrap and set aside in a warm spot to rise for at least an hour. Preheat the oven to 425ºF. Grease two oven-safe bowls (such as the 1-qt pyrex bowls I mentioned above) with about a tablespoon of olive oil each. Using two forks, punch down your dough, scraping it from the sides of the bowl, which it will be clinging to. As you scrape it down try to turn the dough up onto itself if that makes sense. You want to loosen the dough entirely from the sides of the bowl, and you want to make sure you’ve punched it down. Then, take your two forks and divide the dough into two equal portions — eye the center of the mass of dough, and starting from the center and working out, pull the dough apart with the two forks. Then scoop up each half and place into your prepared bowls. This part can be a little messy — the dough is very wet and will slip all over the place. Using small forks or forks with short tines makes this easier. It’s best to scoop it up fast and plop it in the bowl in one fell swoop. Let the dough rise for about 20 to 30 minutes on the countertop near the oven (or near a warm spot) or until it has risen to just below or above (depending on what size bowl you are using) the top of the bowls. Simply set your bowls on top of your oven, so that they are in a warm spot. Twenty minutes in this spot usually is enough for my loaves. Heat olive oil in a sauté pan. Rinse chard and roughly chop into bite sized pieces. Add all ingredients to the sauté pan and cook until wilted. Season to your taste and enjoy warm! Sift in the flour, cocoa powder, baking powder, and salt and fold with a spatula until all ingredients are combined. Be careful not to over-mix. Then, stir in the reserved chocolate pieces. A go to autumn salad! It’s Squash season! I think my new favorite is the buttercup squash from the Organic Farm we have been having in the vegetable subscription recently, and it sure is delicious in this salad. Squash, beets, and kale what a trio! 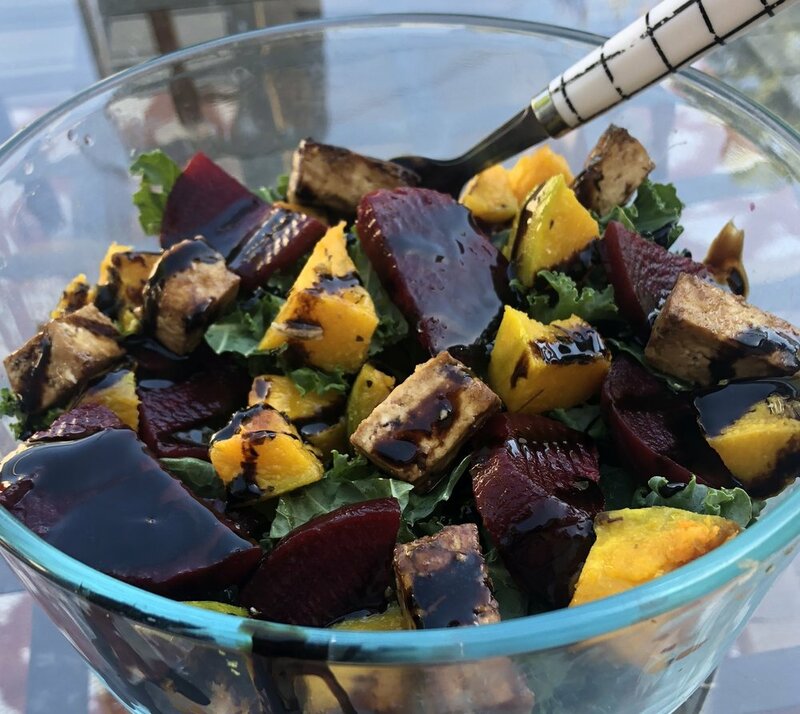 For this salad I had already baked the squash and cooked the beets so all I had to do was throw it on top of some kale, I even added a little balsamic marinated tofu, and dress it all with a citrus vinaigrette and balsamic glaze. To bake the squash I cut it in half and hollowed out the seeds, sliced it into cubes, tossed with olive oil, curry powder, S & P, and baked it at 425 until tender. Salads are one thing that don’t need to be very precise, as long as you have it all there, throw it together and you are pretty much ready to go! You gotta love Pinterest, and fresh veggie pasta! I needed to use up some swiss chard and cauliflower from the veg subscription in a different way and found this yummy recipe on Pinterest. I kept the chard stems in the sauce and you could easily exclude the parmesan cheese to make it vegan! 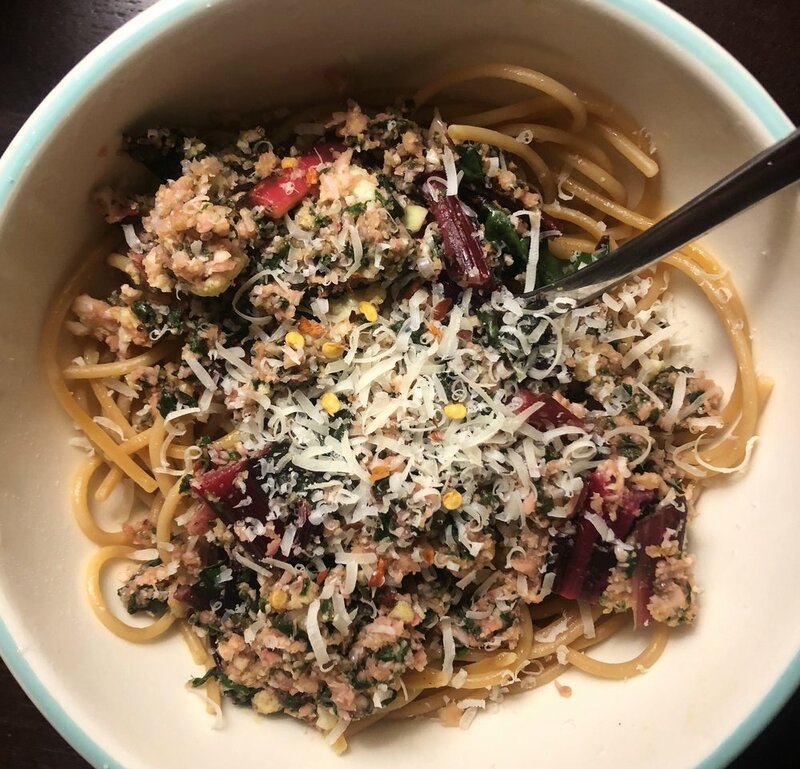 I also love to switch up my pasta from just regular spaghetti noodles to more fun healthy options like zoodles (spiralized zucchini) or lentil/quinoa pastas. Step up your avocado toast game with these quick additions! Here is another quick but scrumptious recipe none the less! Today I thought I would share one of my favorite ways to eat up our huge Cal Poly avocados. It’s a great meal when you’re tight on time but still looking for something healthy to fill you up! Toast your bread, slice the avocado spoon out and fan over toast. Top with sautéed sliced mushrooms. Sprinkle with red pepper flakes to spice things up! S & P to taste, and drizzle with balsamic glaze to top things off! Spice up your life with this Sassy Salsa! Chips’ best friend; Salsa can be much easier and quicker to whip up than you may think, and a great way to use up your CPOF CSA Veggies! Here is a quick recipe that can spice up any dish! Sear the tomatoes and peppers in a large skillet over medium-high heat on the stove top. Rotate the veggies occasionally as to get all of the sides to char and blister. Combine the roasted veggies in a blender or food processor with the green onions, garlic, and juice of the lime. Blend and add spices to taste.